Yesterday Jakob wanted to make a raw dessert, so we went into the kitchen to throw something together. He was a bit shaky, asking for directions :) I'm not much for giving all the details when I show how to make a raw dessert. You learn best by the discipline of trial & error, and if you get some space to figure things out for your self, your intuition is with you and that's when magic really starts to happen. We didn't put any coconut oil in the filling this time. Instead we decided to make a chia pudding filling. For those of you who is new to chia, the seeds swells in liquid and forms a gel, a bit like flax seeds. Chia serves as a stabilizing agent you can have a lot of fun with! This is not the fancy sort of engineered raw pie you'd make to impress your mother in law. 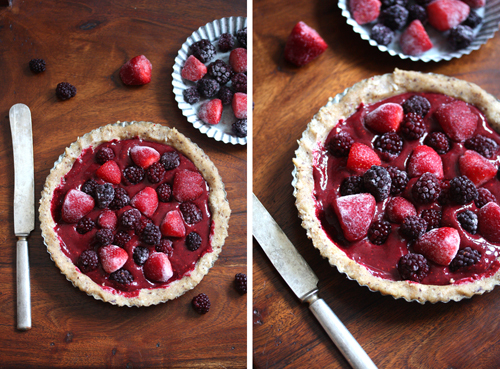 It's an impromptu pie for all of you who love this category of raw desserts. Few ingredients, basic flavors and no fuss :) You can vary this pie in a million ways, using your favorite berries and fruits, add super foods and spices. • If you use blueberries, add a squeeze or two of lime. Lime enhances the blueberry flavor, and also makes pink marks in the blueberry filling (great for decoration). • If you use raspberries, skip the salt. Salt and raspberries DON'T match! • Experiment with the nuts used in the base. Have you tried pistaschios? You will be amazed of how gorgeous they are together with the dates. You can add some whole pistachios to the base to make it crunchy. • Want to go nut free? No problems. Substitute the 1 cup of nuts with 0.5 cup pumpkin seeds and 0.5 cup of shredded coconut. • Use cardamom, nutmeg and / or cinnamon as a seasoning for the base. Jakob's Simple Chia pudding Pie, serves three. Pit and soak the Dates for 5 minutes. Grind the nuts into a flour in your blender or food processor. Add the rest of the ingredients and process until you have a dough. Press down the dough on a plate or pie form measuring about 8 inches (20 cm) across. Add all of the ingredients to your blender. Pour the filling over the base and add some berries on top. Put in the fridge to chill a couple of hours or overnight. Kärna ur och blötlägg Dadlarna i 5 min. Kör nötterna i en matberedare tills du får ett mjöl. Tillsätt då övriga ingredienser och mixa till en deg. Forma ett pajskal av degen på ett fat eller en liten pajform som mäter ca 20 cm. • 2 dl Bär (tex hallon, blåbär och eller jordgubbar). Kör i en mixer och häll fyllningen över pajskalet. Dekorera med mer bär och ställ i kylen några timmar eller över natten för att få en mer puddinglik konsistens. i'm so glad i found your blog. i absolutely love it. i'm really into raw desserts, so your blog is perfect. and your photography is great!! Love this pie! I have been looking for a different way to use chia seeds, and this sounds delicious! I may have to try making it. Happy to have stumbled across your blog :)! I love chia seeds. I had never thought of using it in a dessert like this. The pie looks really delicious. I am very excited to try it. Lovely! My 6-year-old kiddo made this almost completely by herself, and it was delicious. Thank you for the recipe. Malin: Tack söta :) Ellerhur?! Chia är bäst. Katie: You're so welcome! Glad this blog found You! Amy: Im so glad I could inspire you! !